Today, AT&T announced that Nokia first tablet the Nokia Lumia 2520 will be available on November 22nd for $399 on contract. That is not all however, those that are looking to purchase both the tablet and any Windows Phone on AT&T will get the tablet for only $199. AT&T* customers can own a tablet that’s used for more than reading the news and watching videos. The Nokia Lumia 2520, which will be available in black in all AT&T channels beginning on November 22, is a great tool for both consuming and creating content. Customers can purchase the Lumia 2520 for $399.99 with a two-year agreement, or for $199.99 with a two-year agreement when bundled with a Nokia Lumia 925, Nokia Lumia 1020, or Nokia Lumia 1520 smartphone. 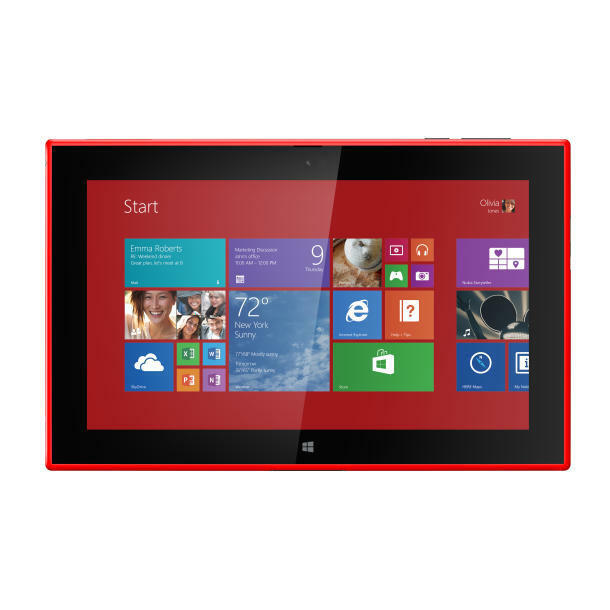 The Nokia Lumia 2520 is a versatile Windows RT 8.1 tablet with a variety of features that helps users stay connected, productive, and entertained. Lumia 2520 has a 10.1” Full High Definition display with ClearBlack technology for amazing outdoor readability so you can even use it in direct sunlight. Enjoy stunning video playback, gaming, and document viewing in 1080p from virtually anywhere. Lumia 2520 comes with built-in Microsoft Office and Outlook, which allows users to create presentations, edit spreadsheets, and keep track of emails wherever they may be. The tablet weighs just 22 ounces and is portable enough to carry on a business trip, family vacation, or around town. The tablet’s powerful 6.7 megapixel rear-facing camera with ZEISS optics makes it easy to capture candid family moments in crisp, true-to-life colors. Windows RT 8.1 also provides users with enhanced home screen and lock screen personalization features and split-screen multitasking to use two apps side by side. Lumia 2520 comes with 32GB of internal memory and a micro-SD slot for expandable memory. The fast-charging 8,000 mAh battery gives users up to 11 hours** of power during video playback and can reach 80% charge in one hour. Pair the Lumia 2520 with the Nokia Power Keyboard, making it easier than ever to do work on the move with up to five additional hours of battery life, a touch pad, and two full USB ports. Dragons Adventure is a gaming app developed in partnership with DreamWorks Animation for school age children. Nokia Storyteller allows you to relive your stories through pictures in a timeline format that is easy to view and organize. Nokia Video Director makes it easy to edit video in a matter of minutes. Nokia Music lets users download and play songs from their favorite artists. The industry leading HERE Maps helps users discover all the best places in any neighborhood, as well as the smartest way to get there. AT&T has the fastest and now most reliable 4G LTE network***. And AT&T was named America’s fastest 4G LTE network in PC Magazine’s 2013 Fastest Mobile Networks 30-market study – and also swept the top rankings in all six U.S. regions from coast to coast: Northeast, Southeast, North-Central, South-Central, Northwest and Southwest. AT&T gives customers the option to purchase the Nokia Lumia 2520 with no down payment, no upgrade fee and no activation fee at $25 monthly installments for the device, with no financing fees. AT&T customers who purchase and activate a Nokia Lumia 2520 between Nov. 22 and Jan. 9, 2014 are eligible for a $20 app voucher for the Windows Store. **** Redemption instructions will be included with the device at purchase. For the complete list of AT&T offerings, visit www.att.com. **Talk and standby times are estimates only. Actual times are affected by, for example, network conditions, device settings, features being used, battery condition, and temperature. *** Speed claim based on national carriers’ average 4G LTE download speeds. Reliability claim based on data transfer completion rates on nationwide 4G LTE networks. 4G LTE not available everywhere. LTE is a trademark of ETSI. ****App offer available with purchase of a Nokia Lumia 2520, Nokia Lumia 1520 or Nokia Lumia 1020. For use in Windows Phone Store only. Offer valid while supplies last. Full terms and conditions apply. $20 Credit Offer Ends 1/9/14. Must purchase and activate an eligible Nokia Lumia smartphone or tablet (925, 1020, 1520, or 2520) at participating locations. Redemption instructions will be provided at time of purchase or receipt of device and are available at www.nokia.com/us-en/lumia-world-of-apps. Code must be entered by 2/15/2014. Use the credit within 180 days of the redemption date or unused value will be removed from Wallet app. Not all apps available across all devices and markets. Other restrictions may apply. Offer void where prohibited by law.